I am back from Tokyo and I was almost able to buy everything I wanted/needed. The thingy on the left is supposed to help to make your face wash super foamy so that it's more effective (and fun, because foam is fun). I spotted this on a shelf by complete accident, which was fortunate indeed. 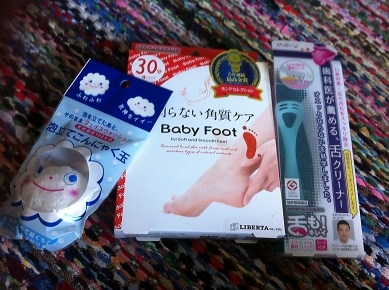 Baby Foot is because my feet need love. This was actually on my list of things to get, haha. And tongue scraper is to clean my tongue! Apparently the tongue is where all the stuff that smells bad remains, etc. I had never heard of specific items for cleaning one's tongue until I saw someone use it on Big Brother Australia or something. Since then I've been looking for something like it in Finland and my impression has been that it simply does not exist. Huh. So I was sure to grab one from Japan when I spotted one on a shelf. 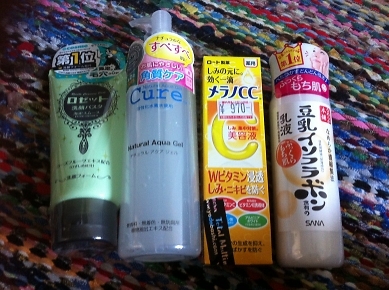 Except I forgot to include the sunscreen I bought, Bioré UV AQUA Rich! 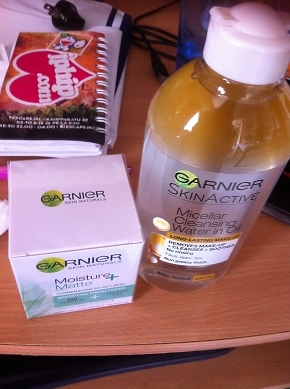 Again, trying to avoid anything that might make my skin oily, so hopefully the moisturizer does have a matte finish as promised. 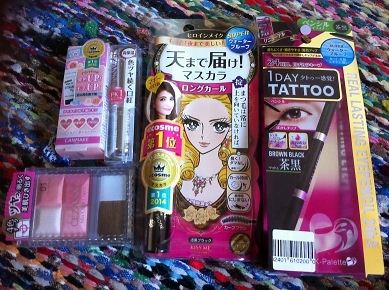 Canmake Lasting Multi Eye Base WP, Cezanne lipstick, Cezanne blush, and the super famous mascara and eyeliner that can be found literally everywhere. What I didn't end up finding was "kiss Mat Chiffon UV Ease N"; it was supposed to be a mattifying primer for the T-zone to prevent skin from becoming oily and such. But I couldn't find a product named exactly this, so again, to avoid any risk, I didn't buy anything. But if everything else I have is mattifying and I live in a relatively 'dry' and cold country, maybe I won't even need it. So I have almost everything I need! Now I should just get started with the experiment, eventually. Unfortunately I am still completely knackered from my trip, so today is not the day. I meant to reply to the last entry but I forgot..